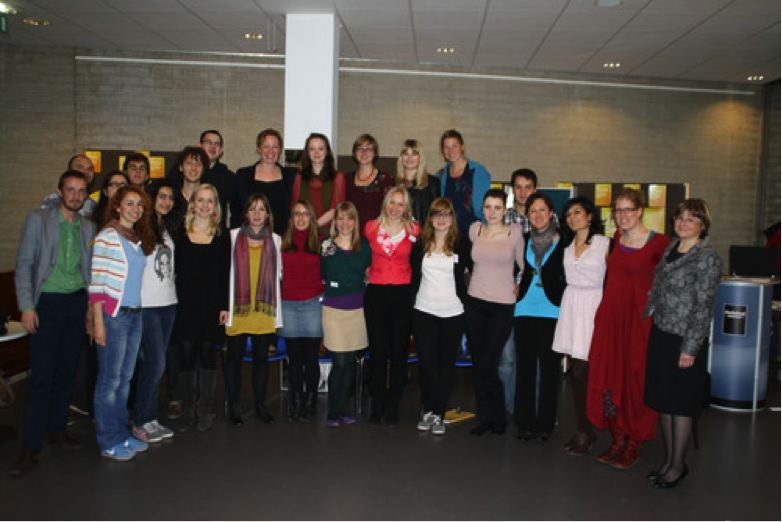 In April 2012, the European Association for Music in Schools held the 20th annual conference; as part of this the 10th Student Forum took place. The focus of the conference was ‘Teacher as Musician – School Perspective’. The conference was held in The Hague, Holland. The student forum provided an opportunity for 25 students to join together to share their experiences and views of music education through discussions, workshops and performances which culminated in a final presentation to the main conference at the end of the forum. On the first evening, the forum was opened by the president of the EAS, Adri de Vugt. He greeted the members and then invited us to enjoy a welcome concert performed by the choir of the host institution. We then heard from both Imre Ploeg and Kilian Baur, the student delegates of the forum. Finally we were introduced to Branka Rotar Prance, the EAS board member responsible for the student forum. Following this, we played a number of familiarisation games which made us feel very welcome, settled the atmosphere and united the group. There was one exercise which particularly stood out; we were split into groups led by the Dutch students, they taught us Frere Jacques in their home language and then as a group we had the freedom to arrange the piece. This was followed by a short performance to the rest of the group. It was interesting to see how differently each of the groups interpreted the brief as there was such variety in the finished products such as changes to the language, structure and melody. Following this we focused on the poster session. Each country had been asked to prepare a poster which showed the education system displaying the main content of the music curriculum for all children in schools and examples of music activities both in school time and out of school. Every country presented to small groups which was then fed back to the main group. As expected, we found both similarities and differences. Similarities were found in the structure of the school system such as Kindergarten, Primary and Secondary/ High School. However, differences could be seen in the style and teaching of music at each stage; the training of teachers; the existence of specialist music schools and the appointment of a specialist music teacher. We then filled in the diary for the day which continued throughout the student forum. The purpose of this was to feed back to Branka, Imre and Kilian how we had found the day and what we had learnt. This culminated the first day of activities; we were then invited to dinner as a group at Jorplace Hostel in Delt which gave us time to get to know each other further and get some well earned rest. We met early the next morning with Branka for the first session of the day; this was our chance to share the songs and activities that we had prepared prior to the forum in small groups. These were traditional songs that we had brought from our own countries. We then presented our favourites in the plenary to the rest of the group. After this we met with the IMC (International Music Council) Secretary, Jesse Boere; he presented us with an outline of the IMC, their values and beliefs and gave us the opportunity to join them. After lunch, Branka gave us an input session on ‘Teacher as Musician, school perspective’. She presented to us the artistic, theoretical and pedagogical aspects of the music teacher. For the first activity the group read articles from P.S Cambell’s book Musician and Teacher; we had to identify the characteristics outlined in the book in ourselves. Having taken these ideas on board, we then had to draw a picture of the ideal music teacher. It was extremely interesting to recognise which characteristics we valued the most. After a short break, Renee Jonker led us in a ‘creative leading’ workshop. This showed us the importance of improvising and creating music. He then showed us a clip of a workshop that he led with children in Holland. From this we learnt the importance of using live instruments as many of the children had never seen or heard them before. It also highlighted how important it is for the children to hear top class musicians performing so that they have something to which to aspire. In the evening we went for pizza with the students from the Doctoral Forum which was very enjoyable. The next day we spent most of our time preparing for the presentation at the main conference. We had to decide how we were going to group our ideas and present them in an effective way. We found this a difficult task as we only had a short amount of time and obviously we all had our own opinions; but everyone was extremely flexible and had such a positive attitude to the task. Today was the end of our student forum and the opening of the EAS conference. In the evening we had a meal at Tapas and Mezzas in the picturesque town of Delft. We had to meet early in the morning as we had a rehearsal in the Concert Hall on the National Conservatoire. The performance went fantastically well and everyone was so pleased with the end product – the hard work had paid off. There was a reception with delicious food and wine; some of the students stayed for the conference, but this was the time for us to go our separate ways. I think we all had the opinion that it is so important for the students to have a voice in the conference and to be able to contribute to the improvements of Music Education in European Countries. It was extremely valuable to learn about music and education in other European countries and we all gained an insight in to new and interesting ideas and teaching methods. We also made a lot of new friends during the forum and hopefully we will all keep in touch in the future. We look forward to the next conference.